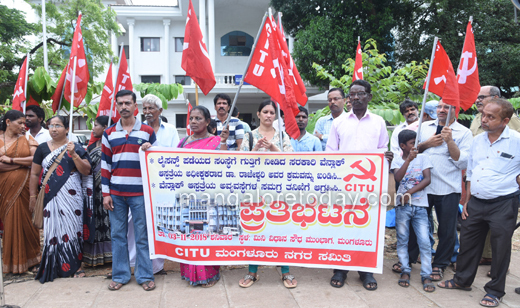 Mangaluru, Nov 03, 2018: The Mangaluru city unit of the CITU staged a protest in front of the Mini Vidhana Saudha on November 3, Saturday demanding a thorough investigation into the alleged act of the Wenlock Superintendent Dr Rajeshwari Devi in awarding a contract for a security agency which did not possess a license while availing the contract. The protestors alleged that the Sai Security which had availed contract at Wenlock has not been providing amenities to the D Group patient care workers who are employed on a contract basis in the Hospital. The protestors also pointed that the firm availed license eight months ago following pressure from higher-ups and has suspected irregularities in the contract awarding process. 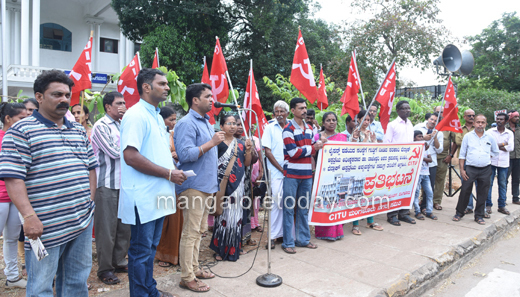 CITU city unit General Secretary Yogish Jeppinamogaru, Sunil Kumar Bajal, Bharathi Bolar, Krishnappa Gowda and others participated in the protest.